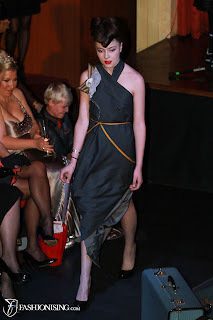 Whilst browsing online for refashion workshops, I stumbled upon Kim Kneipp's website. Kim, aka The Sustainable Stylist, is a sustainable designer, personal stylist and workshop facilitator from Victoria, Australia. 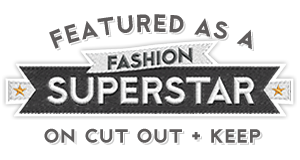 Kim is somewhat of a sustainable stylist guru, offering not only refashioning workshops, but other services including sustainable interior design, ethical shopping excursions, a 'shop your own wardrobe' service, tailored alteration, wardrobe and space design and mental health projects. 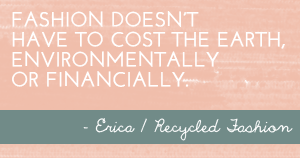 Kim spares us some time to answer some questions for Recycled Fashion readers, regarding her work, her history, her values, and her future goals. Kim shares images from a workshop held at the Whitehouse Design School earlier this year. "Headed by stylist Philip Boon, the 3rd year styling students at Whitehouse were contracted by Prahran Mission to put on a charity fundraising event to celebrate their 65th anniversary. 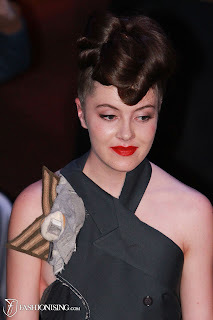 Using only donated, second hand pieces and garments found within their Prahran City Mission Op-Shop, the students put on a fantastic catwalk auction event at Red Bennies on Chapel Street. (it was back in June). You can read more about this project here. The first mental health refashioning workshop I had ever run was with Prahran Mission back in 2000, so I was thrilled to be involved! 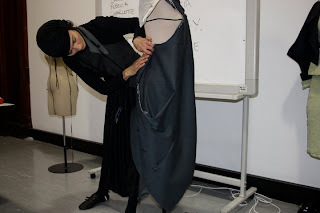 As well running a workshop to show the students how to refashion and rework some of their garments, I was also one of the designers who contributed a garment for the fundraising auction. 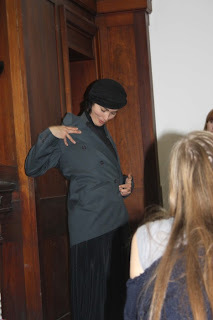 The photos I've sent through are of me during the workshop, playing with the jacket that I then sent down the catwalk. " Kim reconstructed a suit jacket into a fabulous dress.. Thank you so much for your time Kim, we wish you every success in your sustainable business. this girl is amazing, a suit to dress ? Awesome! I just added this feed to my bookmarks. I have to say, I very much enjoy reading your blogs. Keep it up!